As part of the team-based approach, CSMART Acad- training excellence, in July 2016 Carnival Corporation ex- relentless focus on world-class training and continuous emy introduced new ways of communicating. In a de- panded its training operations with the opening of the Aris- parture from past protocol, this includes encouraging improvement, underscoring that the safety of our guests on Maritime Center, featuring the CSMART Academy and and crew is the corporation’s number one priority. This team members of all ranks and seniority to speak up to a 176-room CSMART-Hotel. At nearly 110,000 sq. ft., the results in a continuous investment by Carnival Corpo- challenge or question a decision. 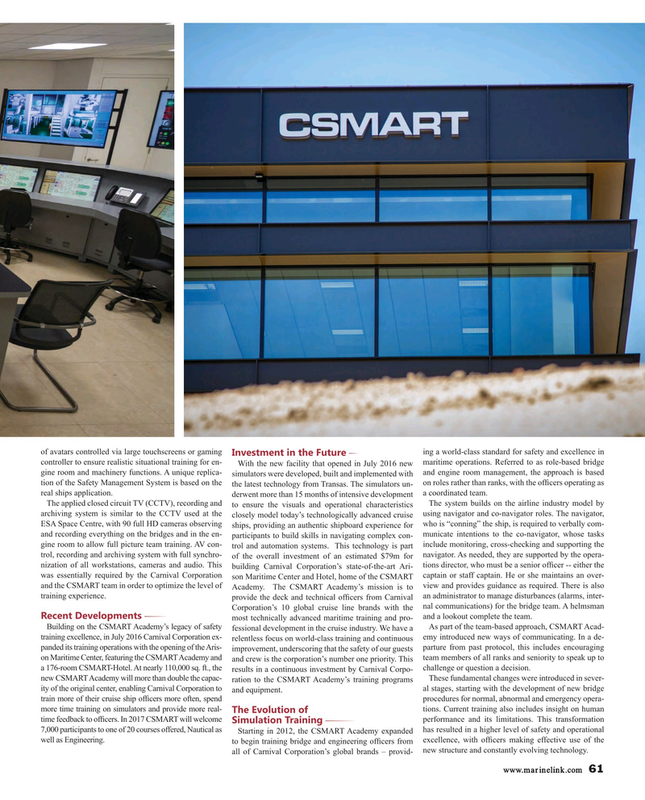 Simulation Training 7,000 participants to one of 20 courses offered, Nautical as Starting in 2012, the CSMART Academy expanded has resulted in a higher level of safety and operational well as Engineering. to begin training bridge and engineering of? cers from excellence, with of? cers making effective use of the new structure and constantly evolving technology.